Few weeks ago a friend of mine from Toronto, Melissa, came to visit me. Melissa and I both did our postgraduate degrees in Edinburgh in year 2000, after which she left first to her native South Africa and then moved to Toronto to do her doctorate. She had promised to visit me on several occasions since she left Scotland, and we even managed to meet up at a conference in London at one point. Now, finally, she - and her beautiful 9-month old daughter Natali - came to Estonia for a brief, 8-day visit. And this gave me an opportunity to try some Jewish recipes I had been wanting to try for a while. You see, Melissa is Jewish, who keeps kosher. And she's vegetarian. In this Land of Pork Chops Served with Cheese Sauce, it was easiest for us to eat at home. And one night, I baked us a batch of Rugelach. Rugelach - when said with a low, husky voice, and repeatedly, sounds sweet and funny (at least little Natali seemed to think so! ), like something out a fairy tale, so I was thrilled to be finally making them. And they sure were moreish - sweet, flakey, fragrant, and very, very tasty. 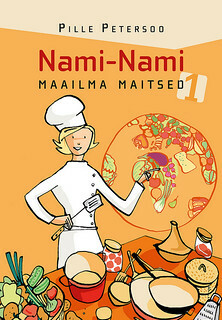 I adapted a recipe from Clarissa Hyman's book The Jewish Kitchen: Recipes and Stories from Around the World. Note these are not parve/pareve or 'neutral', as they contain cream cheese, so don't serve them after a meat meal, if you're trying to keep kosher. Cream the warm butter and cream cheese until well blender. Beat in the sugar, then stir in the flour and salt. Mix until the dough begins to hold together, press into a ball, wrap in clingfilm and chill overnight in the fridge. Combine the ground nuts, brown sugar, cocoa powder and cinnamon. Divide the dough ball into two and return the other half into the fridge. Roll out the pastry on a slightly floured surface into a thin circle about 25 cm /10 inches in diametre. Using a sharp knife or a pizza-wheel, cut into 16 equal wedges. Brush the surface of the wedges with melted butter, then sprinkle half of the nut and cocoa mixture on top, spreading evenly as you go. Using your hand or a rolling pin, press the filling tightly down into the dough (there seems to be a lot of filling, but it'll make the pastries only nicer!). Carefully roll up each wedge tightly, starting from the wider, outside end. You'll end up with 16 mini croissants. Brush with egg white wash.
Cover a baking tray with parchment paper and bake at the middle of a preheated 180 C/350 F oven for 20-30 minutes, until the rugelach are golden brown. Leave to cool slightly, then transfer to a wire rack. Repeat with the second half of the pastry - even straight away or on the following day. I do think the name sounds sweet and fairytale-esque! :) And it sure does look yummy! Gorgeous photo, and it looks delicious! Yummy, they look perfect. I'm Jewish too, but don't keep kosher. What else did you feed her? Since you didnt have to worry about serving dairy with meat was it easier? delicious! 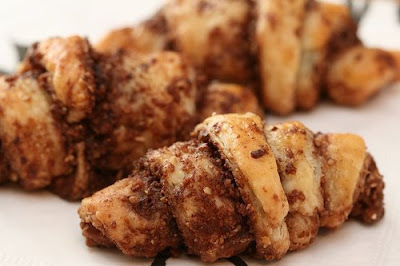 I love rugelach and these sound great with the hazelnuts. i love that book.. I have worked on a boat that is owned by a Jewish family and there are great cookbooks n Jewish cooking. Dang, the link for Pork Chops Served with Cheese Sauce doesn't work. OK, just kidding. I actually find nothing better for cooking creativity than not combining meat and dairy. I don't remember the last time I did it, though there's no religious reason. I think I'll buy that book as a Xmas present for my dad, who is Jewish but non-observant and doesn't often cook Jewish food. We'll try this recipe when I'm over at his place for the Xmas holiday, using gluten-free flour, and see how it comes out. Randi - it was quite tricky to decide what to cook, as she was also vegetarian and also ate cheese which was kosher (and as I don't know if Estonian cheese-makers use non-animal rennet, we skipped the cheese altogether). We had lots of vegetable dishes, and I also made hummus and baba ganush etc. Shalimar - these were surprisingly easy - and very scrumptious! Kristopher - you're so cheeky! There's no religious reason for not combining meat and dairy either (not a rule in Lutheran Protestant church, you know), but it was definitely a new way of devising a menu for me. Awoz - give this recipe a go, too! Trig - I think my favourite Jewish cookbook is still Claudia Roden's "Book of Jewish Food" - but that was for all the historical culinary information. It read like an anthropology book (my minor at the University). 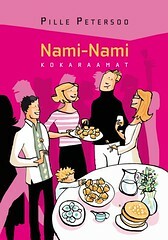 This one by Hyman has lots of tempting recipes, however! ChichaJo, Kalyn, Patricia, Kevin, Elizabeth - thank you!! These look absolutely gorgeous...can't wait to try them! Pretty snapshot too. 1. Cut cold butter or margarine and cream cheese into bits. In food processor pulse flour, salt, butter or margarine, cream cheese and sour cream until crumbly. 2. Shape crumbly mixture into four equal disks...wrap each disk and chill 2 hours or up to 2 days. 3. Roll each disk into a 9 inch round keeping other disks chilled until ready to roll them. 4. Combine sugar and cinnamon. 5. Roll each disk into a 9 inch round keeping other disks chilled until ready to roll them. Sprinkle round with sugar/nut mixture. Press lightly into dough. With chefs knife or pizza cutter, cut each round into 12 wedges. Roll wedges from wide to narrow, you will end up with point on outside of cookie. Place on ungreased baking sheets and chill rugelach 20 minutes before baking. 6. Preheat oven to 350 degrees F (180 degrees C). 7. After rugelach are chilled, bake them in the center rack of your oven 22 minutes until lightly golden. Cool on wire racks. Store in airtight containers...they freeze very well. 8. Variations: Before putting the filling on the dough, use a pastry brush to layer apricot jam as well as brown sugar. Then add the recommended filling. You may also make a mixture of cinnamon and sugar and roll the rugelach in this prior to putting them on the cookie sheets.